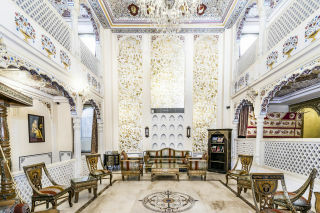 Situated just 5 km from Hawa Mahal, this is an offering of a private room in a heritage stay that can accommodate two guests. This property boasts an in-house bar and restaurant, where you can relish delectable meals. The heritage also has a spa, a swimming pool on the terrace and ample parking area makes it convenient for those on a road journey. 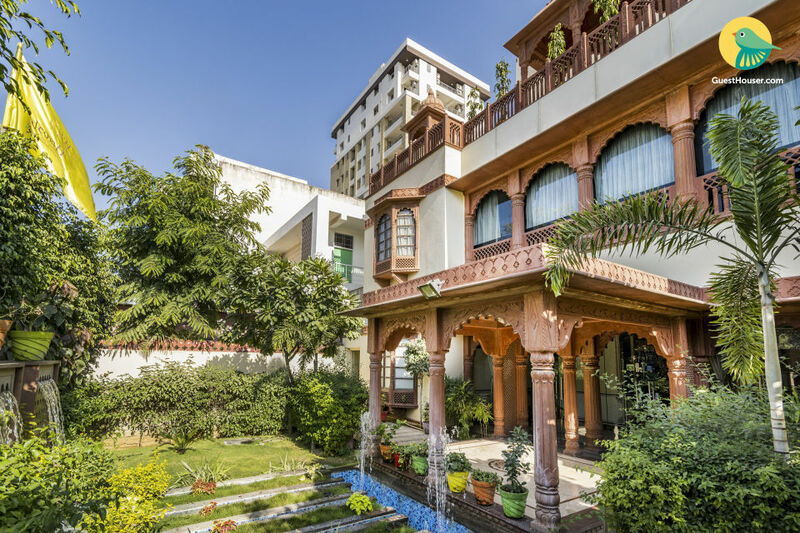 Your Space This heritage abode boasts Rajasthani architectural style and features a well-tended lawn enhanced by potted plants. The interiors exude elegance and classicism, with a sitting area that is appointed with chic vintage upholstered sofa and complementing armchairs, a coffee table, and a corner cabinet, all of which gives the room a rustic touch. The property has another sitting area as well, which has ceiling adorned with meticulously done painting and is furnished with traditional sofa and armchairs, a glass-topped coffee table, and a wooden cabinet. The dining area is well-appointed with classy wooden dinettes, so that you can comfortably savour meals. 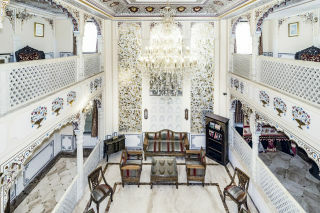 The lounge radiates sheer grandiosity, with marble flooring, opulent chandelier, floral wall decals, and jaali-style railings. This room is furnished with plush upholstered wooden chairs and a swing, a corner bookshelf, and an archaic cabinet. The spa is well-equipped and you and your partner get a relaxing massage done here. The in-house restaurant is appointed with vibrant chairs and tables, where you can relish delectable Rajasthani food. The terrace area has an in-house bar and a swimming pool, which makes it the perfect place to sip martinis and take a refreshing swim. This area is appointed with cushioned rattan chairs, where you can simply sit back and unwind. The room on offer has a double bed with bedside table lamps, a floral patterned chaise lounge chair, a dressing table, a utility table, a mirrored wardrobe, and a wall-mounted television for entertainment and leisure. A heritage property which is located in city centre and is close to the railway station and airport. 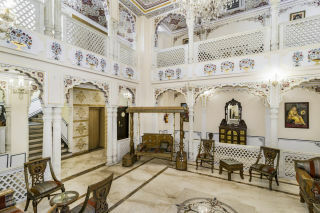 The rooms of the haveli have a remarkable mix of traditional and contemporary décor. The outdoor pool is on the rooftop where one can enjoy the view while relaxing in the pool. 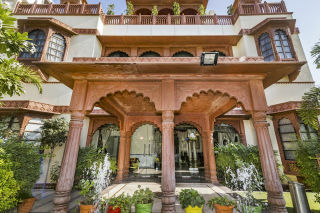 The in-house restaurant serves authentic Rajasthani cuisine and the overall dining experience is wonderful.